In our area, it’s hard to get a good taco. No offense to fast food establishments or many of our local restaurants but the flavor profile is very generic. Interestingly, when I perused taco recipes, I was surprised to see so many using generic chili powder, maybe that’s why they all taste the same. These Beef Tacos with Lime Sour Cream use my unique seasoning blend for maximum flavor. I used a combination of my go-to spices: ancho chili powder for its warm smoky characteristics, cumin, coriander and Mexican oregano because you can’t make tacos without these traditional ingredients and for a little heat, chipotle powder. There are many garnishes to choose from. I like to put shredded cheese over the top of the tacos and let it melt and then drizzle a sauce, like the lime sour cream recipe included here. I might top one with salsa crudo, one with guacamole, and another with chopped scallions and pickled jalalpenos. If you can’t decide or want to mix it up, put little dollops of a few toppings on your plate to have something different with each bite! Heat the oil in a four-quart Dutch oven or heavy-bottomed saucepan over high. 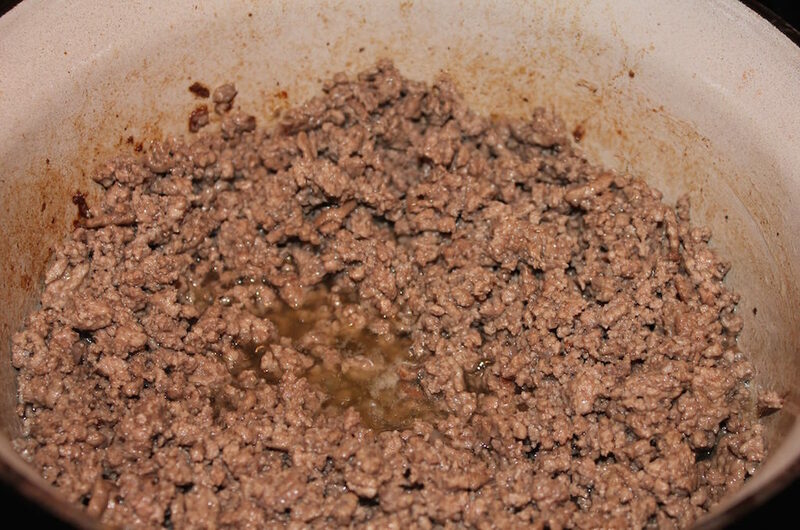 Place the beef and salt in the hot oil and with the tip of a wooden spoon break it up into crumbles. 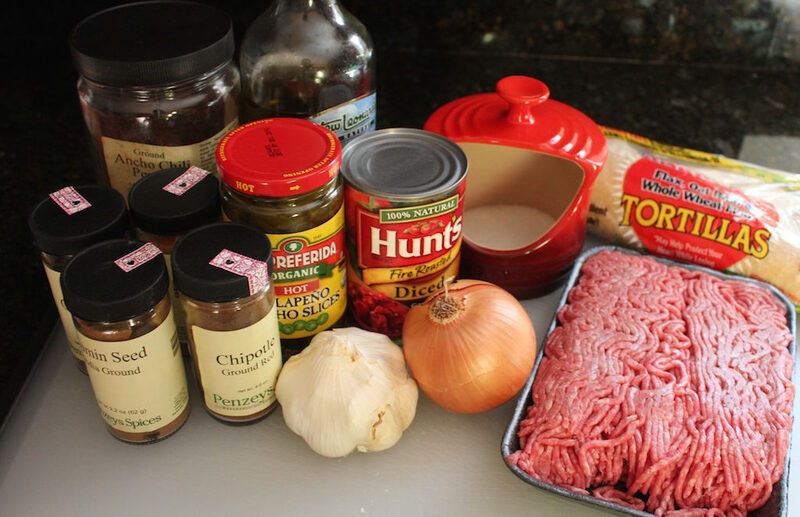 Cook until the beef is no longer red. Stir in the onions and garlic, cover and sweat for five minutes. 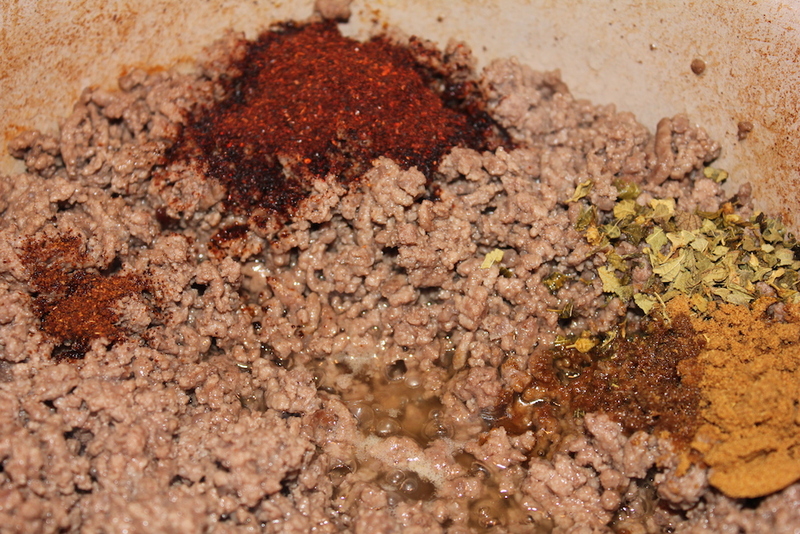 Add the ancho chili powder, cumin, coriander, oregano and chipotle chili powder, stir and cook for 30 seconds. 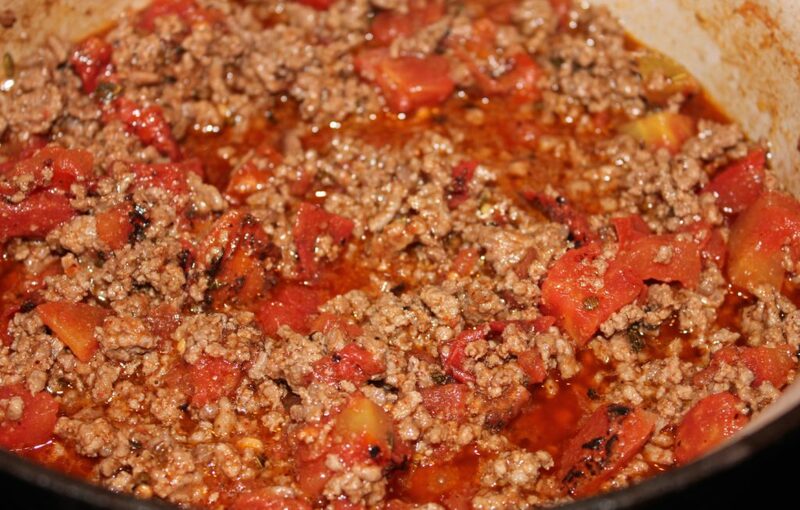 Stir in the tomatoes and water, bring to a boil, reduce heat to a simmer, cover and cook for one hour, stirring occasionally to prevent the beef mixture from sticking to the bottom of the pan. Use a 1/4 cup measure to scoop the taco mixture onto each tortilla. Fold and put on a plate or platter. Sprinkle the top with shredded cheese and melt in the microwave for 15 seconds or in the oven. Drizzle with the lime sour cream sauce and garnish to your liking. Whisk together and pour into a squeeze bottle. I used a combination of my go-to spices: ancho chili powder for its warm smoky characteristics, cumin, coriander and Mexican oregano because you can’t make tacos without these traditional ingredients and for a little heat from chipotle powder. Garnishes: shredded cheese, such as Monterrey Jack or Cheddar, lime sour cream, chopped cilantro, chopped scallions, pica di gallo, chopped pickled jalapenos, sliced black olives, avocado slices sprinkled with lemon juice and salt, shredded iceberg lettuce sprinkled with salt, guacamole or anything else you like. 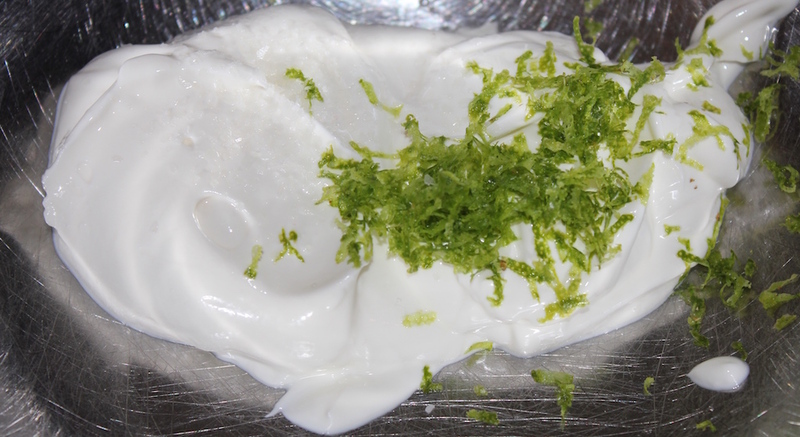 Whisk the sour cream, lime zest and salt together. 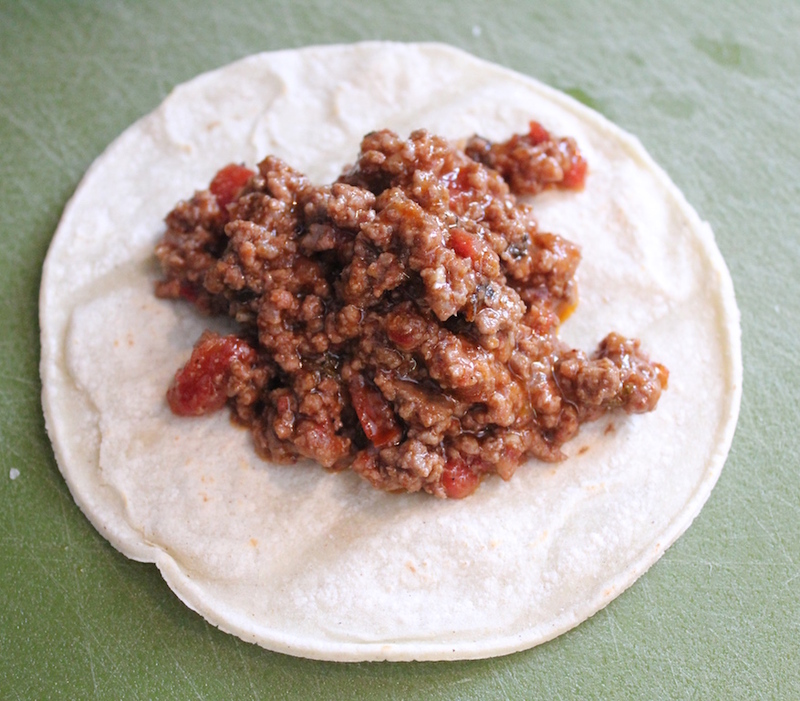 Use a 1/4 cup measure to scoop taco mixture onto each tortilla. Fold and put on a plate or platter. Sprinkle with shredded cheese and melt in the microwave on high for 15 seconds or in the oven for two minutes. Drizzle with lime sour cream sauce and garnish to your liking.